So a good bench-mark would be writing 25,000 words in 15 days. 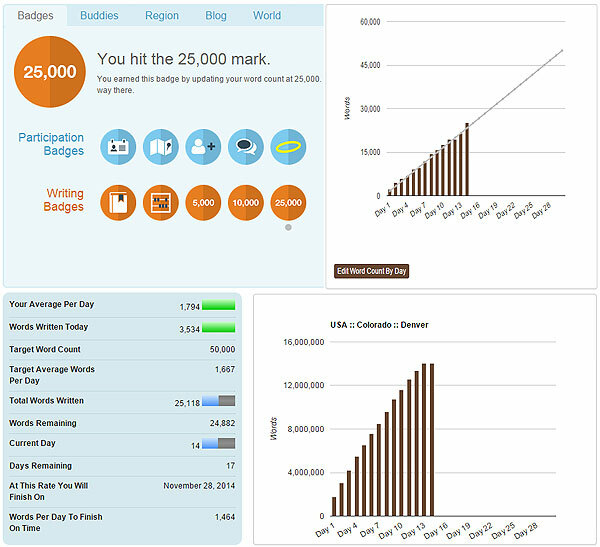 Thanks to an “internal challenge” I had with a couple of my “mentorees” through the NaNoWriMo site, where we challenged each other to reach 25,000 by Friday, I’m happy to report that I earned my 25,000 Writing Badge yesterday. Woo-hoo! Here’s a graphic showing the four main statistics from the NaNoWriMo site. In the upper left-hand corner are the Participation Badges (completed) and the Writing Badges, displaying my latest accomplishment of 25,000 words. The next Writing Badge to earn is by validating my word count, but I can’t do that yet, because I’m not at 50,000 words. In the upper right-hand corner is my daily stats in bar graph form imposed against an average line chart for where I need to be to write 50,000 words in 30 days. I’m basically right on schedule. In the lower left-hand corner are all the statistics I’ve been reporting on daily through this blog; this is how they appear on the NaNoWriMo site. What a red-letter day! The number of words I have written exceeds the number of words remaining. And, finally, I’m tracking to finish ahead of schedule again (although Thanksgiving is bound to put a damper on that, so if I was ambitious, I’d aim to be at 50,000 words by the 26th.) Don’t want to get tripped up by tryptophan! In the lower right-hand corner are the bar graphs displaying the cummulative word-count totals of all the NaNoWriMo participants in the Denver area. 14 million words and counting! I wonder where all those people are going to publish their books? I know where I would suggest, but then again, I’m biased. We’re on the downhill slope, fellow WriMo’s.